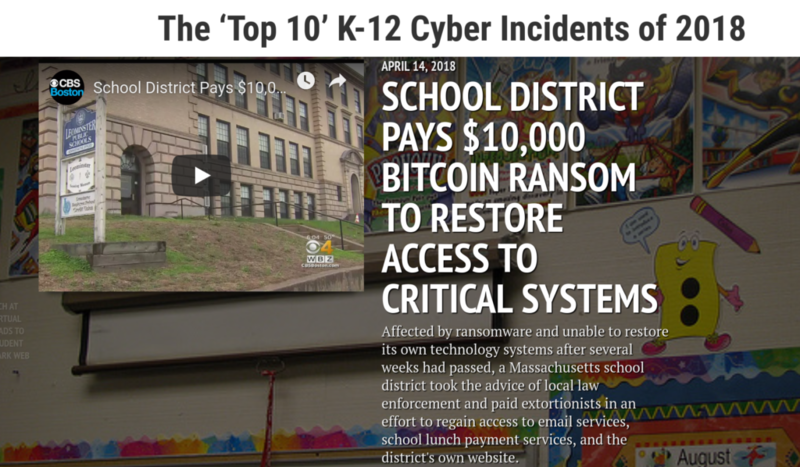 The interactive report includes a timeline of local TV news reports of the ‘Top 10’ cybersecurity incidents of 2018, which helps to portray both the variety and real-world impact of cyber incidents affecting public school students and educators. Since 2016, the K-12 Cyber Incident Map has documented over 415 publicly disclosed incidents, which equates to a rate of about one new publicly-reported incident every three days. The K-12 Cybersecurity Resource Center was launched in 2018 to build a knowledge base about the emerging cybersecurity risks facing U.S. K-12 public schools and to help identify and implement promising policies and practices to better manage those risks. It is maintained as a free, independent service to the K-12 community by EdTech Strategies, LLC, a boutique consultancy focused on providing strategic research and counsel on issues at the intersection of education, public policy, technology, and innovation. For more information, please visit: https://k12cybersecure.com.